Johns Hopkins Medicine (JHM), headquartered in Baltimore, Maryland, is an $8 billion integrated global health enterprise and one of the leading health care systems in the United States. Johns Hopkins Medicine unites physicians and scientists of the Johns Hopkins University School of Medicine with the organizations, health professionals and facilities of The Johns Hopkins Hospital and Health System. Video has become the preferred method for marketing the hospital as a meaningful and strategic way of sharing content. This includes patient success stories, doctor profiles, research, Q&As about specific disease/treatment options and community outreach programs. To create so many video assets, the Johns Hopkins Marketing and Communications video team includes editors, shooters as well as animation designers and outside freelancers, as required. Originally, the team used a collection of individual external drives to store and transport video media. Shared drives were frequently sent through the mail and carried to and from the studio and the hospital campus. Installing a Facilis shared storage system removed the need to physically transport camera media while eliminating the time to make copies between editors and shooters. Since the initial installation, the Facilis system has become the hub for not only staff, but other important systems. The team uses CatDV for media management and StorageDNAfor backup and archive. Both systems are tightly integrated with the Facilis shared storage network. Connectivity options for the editors was a key requirement. The dual connectivity utilizing both Fibre Channel and Ethernet is an important part of the system. The Facilis web console is the principal interface for managing the TerraBlock from a simple browser interface. Wi-Fi connections through a secure VPN enable those with permission to access volumes remotely. 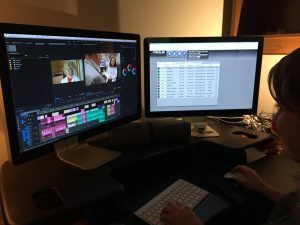 With Facilis—and the new web console—the editors are able to connect remotely to the TerraBlock and work seamlessly within the group’s video workflow. The web console facilitates a reliable connection while giving the administrator the ability to easily view and manage remote user groups. The Facilis FastTracker was well received by editors as an alternative to searching for certain types of material without switching interfaces to CatDV. The system admin has cataloged a portion of the most frequently used b-roll and master versions of material for quick retrieval with FastTracker. The TerraBlock acts as a hub where everyone and everything comes together in one spot, including the other supporting infrastructure from CatDV and StorageDNA.